Eleven residents of Aurora and Georgina have been charged following a drug bust on Kennedy Street West last week. According to York Regional Police, the charges stem from an investigation which began in early October into “suspects who were believed to have been trafficking a variety of drugs” from a home at 320 Kennedy Street West. Eight individuals were arrested on Monday, November 6 and Tuesday, November 7 after “interacting” with the residents of the home in question. Shortly after 8 p.m. on the Tuesday night, a search warrant was executed on 320 Kennedy Street west and York Regional Police say they found three people inside along with more than 200 grams of cocaine, five pounds of cannabis, more than 1,300 Xanax pills, 28 Oxycontin tablets, two replica hand guns, more than $17,000 in Canadian dollars and $3,600 in counterfeit U.S. cash. Charged in the home were Sammy Wehab, 21, Derek Kieback, 20, along with a 17-year-old female, all from Aurora. Charges include possession for the purpose of trafficking cocaine, cannabis, oxycontin, and alprazolam; possession of property obtained by crime over $5,000, and possession for a weapon for a dangerous purpose. 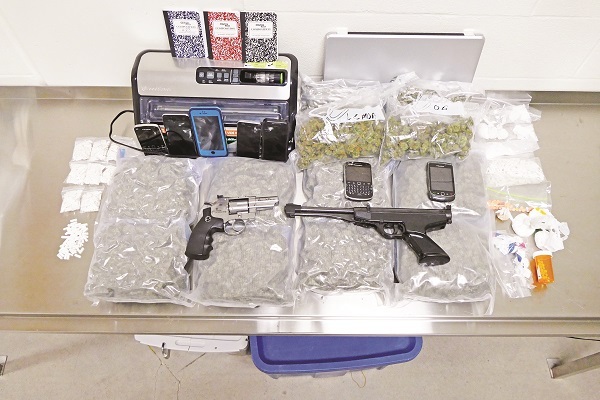 Charged with possession of cocaine and cannabis are Debra Miller, 55, and Edward Stewart, 56, both of Aurora, along with Cody Wegg, 20, Bethany Morell, and a 16-year-male, all from Georgina. Charged with possession of cocaine is 21-year-old Owen Woodcock of Aurora, and charged with possession of cannabis are a male and female, both 17, and both from Aurora. The charges have not been proven. Anyone with information is asked to contact the York Regional Police Guns, Gangs and Drug Enforcement Unit at 1-866-876-5423, ext. 7817, or call Crime Stoppers at 1-800-222-tips, leave an anonymous tip online at www.1800222tips.com or text your tip to CRIMES (274637) starting with the word YORK.